Here is the second part of my selection from TEFAF. Gauguin was fascinated by Breton people, their simple lifestyle and harmony with nature. Before travelling to the French Polynesia, he found in Brittany part of the primitive and isolated paradise he was constantly seeking. 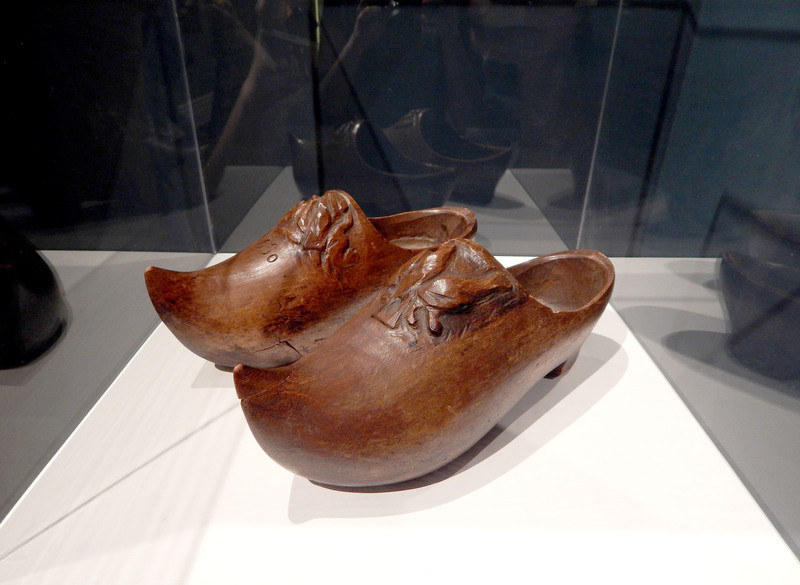 These clogs are one of three pairs of wooden traditional Breton sabots carved by Paul Gauguin. The other two are in the National Gallery of Art in Washington and in a private collection in Paris. The pair showed at TEFAF, signed in the right shoe P Go, went under the hammer in Sotheby`s New York in 2011 with an estimate of $100,000 – 150,000 and sold to an American collector for $338,500, more than double their high estimate. Three years later, Dickinson has priced the pair at 400,000€. Dickinson was not the only gallery showing Anish Kapoor`s plates. 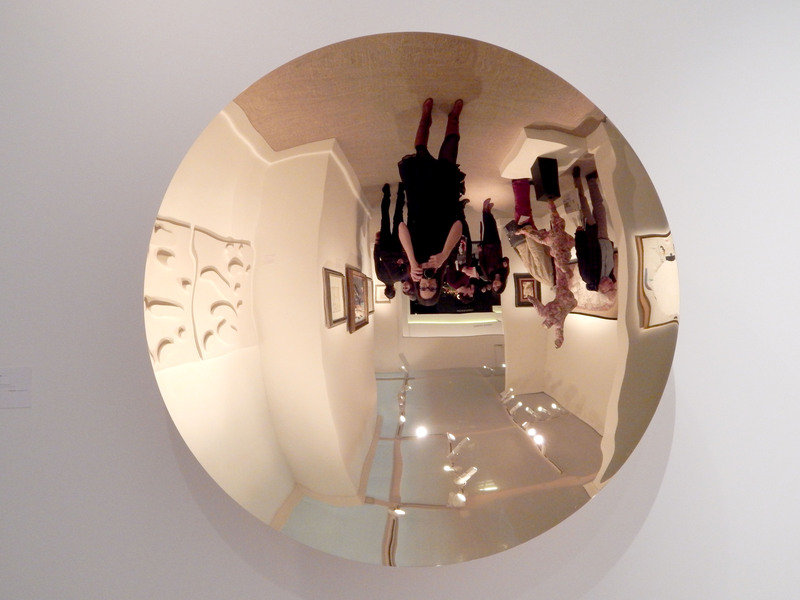 In fact, there were quite a few examples of those intriguing works that attract and confuse the viewer with their reflections and optical effects. This concave stainless steel and gold plate (120 x 120 x 27.5 cm) was priced at 950,000€. 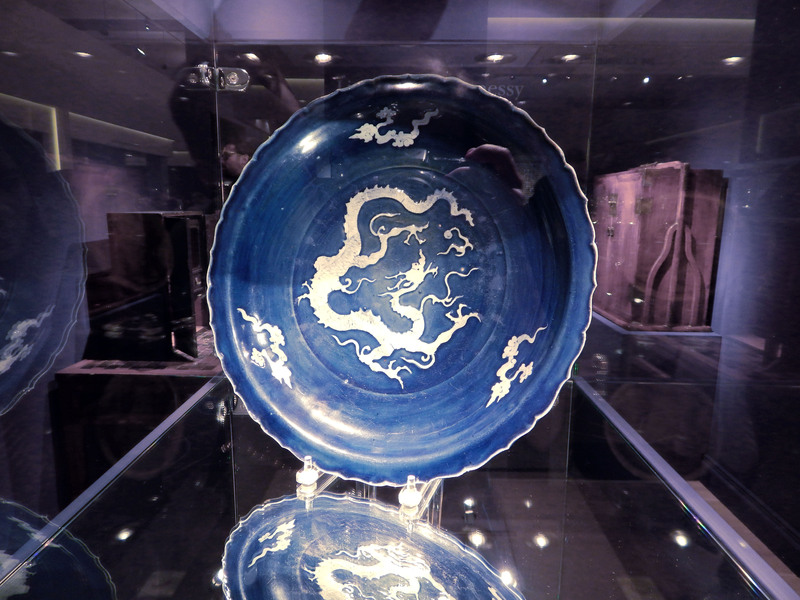 Together with the antique Japanese screens, Cocteau`s ceramics were among the items I enjoyed the most at TEFAF. 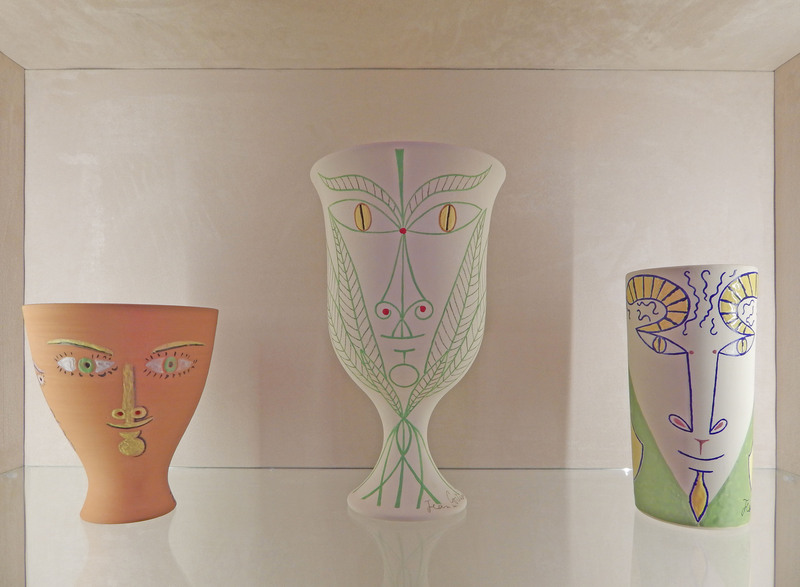 William Weston Gallery showed a fascinating selection of plates and vases made by Cocteau in the pottery of Madeline-Jolly in Villefranche-sur-Mer (France) during the period between 1958 and 1963. Although his aesthetic owe his friend Picasso so much, he introduced innovations such as the oxide pencil that gave his designs the appearance of drawing or pastel. In the vase in the centre of the photograph above, he used that pencil in three different colours (orange, white and green) and added enamel to highlight details, such as the eyes, over the raw background of white ceramic. Priced at 18,000€, it belongs to an edition of 15 and it is inscribed as exemplaire d`auteur. Christie`s sold the version 7/15 in Amsterdam in 2011 for 1,875€ (why such a huge difference? Its provenance?, because it is the artist`s example? Both are in very good condition, signed and inscribed as Edition Originale de Jean Cocteau. Atelier Madeline-Jolly). This plate (40.1 cm in diameter) is one of the most expensive objects in TEFAF. It sold for €16 million. Apparently, the reason that justifies such a staggering price is the rarity of the dish. On one hand, it is one of only three similar large plates known to exist and the only one available on the market. The other two are in the National Museum of Iran and in the Ottoman palace, Topkapi Saray, in Istanbul. On the other hand, the glaze is made with cobalt blue, a very rare commodity imported from Persia. Strongly contrasting with the deep blue background, the sparse decoration consists of a white three-clawed dragon and three clouds scattered around the well. Beach is one of Yi Hwan Kwon`s distorted sculptures that startle you when you bump into them. This Korean artist plays with perspective and perception, transforming 2D images into 3D sculptures. He uses computer technology to compress or elongate his figurative subjects, creating a blurred perception, and cast them in FRP (Fibre-Reinforced Plastic). Beach is a limited edition of 5.